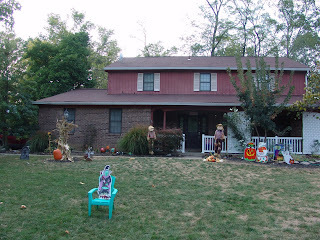 When we got home from Shaw's farm yesterday we decorated our yard for Halloween. 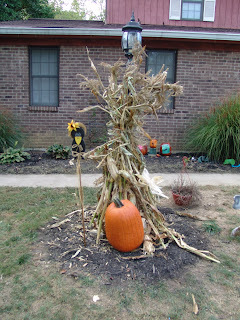 Ryan is so into Halloween this year, he has always loved it but he is just nuts this year. 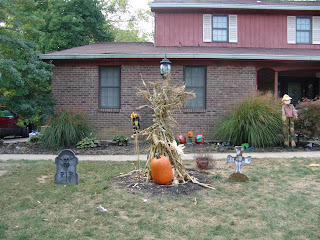 We put up our corn stalk we got and the Scarecrows we had from a few years ago. 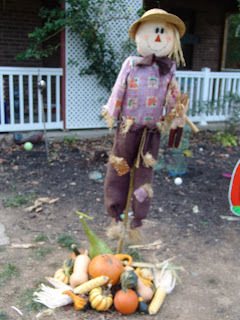 I made a lovely gourd and pumpkin display, then Ryan tells me it looks like Thanksgiving not Halloween, not true it was a very natural display. Then Kev got out all the Halloween signs and stuff we had in the garage and Ryan was in HEAVEN! He has signs all over our yard. Thankfully Dad got most of them at an auction and gave them to us. 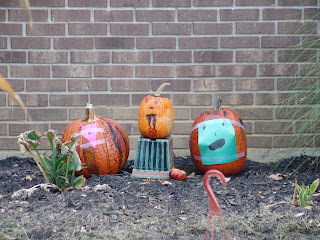 You can certainly tell we are ready for Halloween now! When can you come and do my yard? I like it. 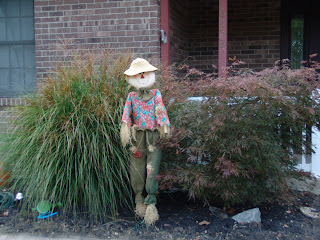 I am so jealous, we don't have ANY halloween decorations. I love it all!